I am always looking for new, cute costumes for my small children. This year, my daughter was getting ready to turn 1 and had started walking and all of the costumes her size were ‘bunting’ style. We saw the idea of Campbells Chicken Noodle Soup, but it was just too boring. So, we decided to jazz it up a little. We made her into the ‘chicken’ in the chicken noodle soup. We gave her feathers by attaching them to washrag (but you can use a hat) and attached it to string to tie around her face. She wore white leggings that we dyed yellow, and then made some ‘claws’ out of yellow material and attached elastic to them to attach around her shoes. We then made the chickn noodle soup outfit out of red and white material. 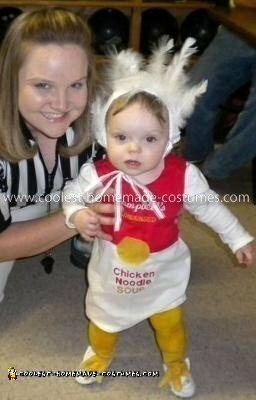 This Homemade Chicken Noodle Soup Baby Costume was a hit!